طهرانی مقدم, مهدیه, شاکرمی, امین, پورعباسی, عطااله. (1397). ملاحظات توانمندسازی نوجوانان در حوزه مفاهیم مرتبط با بلوغ از منظر آموزه‌های دینی و فرهنگی. طب و تزکیه, 27(ویژنامه علوم انسانی سلامت), 12-22. مهدیه طهرانی مقدم; امین شاکرمی; عطااله پورعباسی. "ملاحظات توانمندسازی نوجوانان در حوزه مفاهیم مرتبط با بلوغ از منظر آموزه‌های دینی و فرهنگی". طب و تزکیه, 27, ویژنامه علوم انسانی سلامت, 1397, 12-22. طهرانی مقدم, مهدیه, شاکرمی, امین, پورعباسی, عطااله. (1397). 'ملاحظات توانمندسازی نوجوانان در حوزه مفاهیم مرتبط با بلوغ از منظر آموزه‌های دینی و فرهنگی', طب و تزکیه, 27(ویژنامه علوم انسانی سلامت), pp. 12-22. طهرانی مقدم, مهدیه, شاکرمی, امین, پورعباسی, عطااله. ملاحظات توانمندسازی نوجوانان در حوزه مفاهیم مرتبط با بلوغ از منظر آموزه‌های دینی و فرهنگی. طب و تزکیه, 1397; 27(ویژنامه علوم انسانی سلامت): 12-22. 2کارشناسی ارشد روانشناسی تربیتی، گروه روانشناسی تربیتی، دانشکده روانشناسی و علوم تربیتی، دانشگاه علامه طباطبایی، تهران، ایران. زمینه و هدف: دوران بلوغ در نوجوانان با تغییرات جسمی، روانی و خلقی بسیاری همراه است و عدم آمادگی و کسب اطلاعات لازم در هر دو جنس ، گاهی سبب سردرگمی و ایجاد انواع بحران ها در نوجوانان می شود. از طرفی، خلا تحقیقاتی در این زمینه، تولید محتوای آموزشی جامع و ارائه اثربخش این آموزش برای نوجوانان را ضروری می سازد. مطالعه حاضر در صدد بررسی ابعاد مختلف تولید و ارائه محتوای آموزشی بلوغ با تکیه بر آموزه های دینی و فرهنگی کشورمان است. روش بررسی: در این مطالعه که با روش تحلیلی – کتابخانه ای انجام شده، از کتب و مقالات حوزه روانشناسی با موضوع بهداشت فیزیکی و روانی مسائل نوجوانی و نیز کتب روایی، احکام و منابع دینی و فرهنگی موجود در زمینه بلوغ استفاده شده است. در این پژوهش همه موارد اخلاقی رعایت شده است؛ علاوه بر این نویسندگان مقاله هیچ گونه تضاد منافعی گزارش نکرده اند. یافته ها: پس از بررسی متون مورد استفاده، یافته ها نشان داد؛ تدوین محتوا و آموزش مسائل نوجوانی در سه سطح آگاهی بخشی، نهادینه سازی باور و بینش و باید ها و نباید های رفتاری مفید بوده و توجه به راهکارهایی برای توانمندسازی نوجوانان در این حوزه از جمله شروع آموزش، آموزش دهنده و نوع محتوا کمک کننده است. نتیجه گیری: برای تدوین محتوای آموزشی چند بعدی و همه جانبه مسائل نوجوانی، بهره مندی از آموزه های دینی و فرهنگی ضروری به نظر می رسد. 3Endocrinology and Metabolism Research Center, Endocrinology and Metabolism Clinical Sciences Institute, Tehran University of Medical Sciences, Tehran, Iran. Background& Objective: Puberty happens through physical and psychological challenges, and considering the critical role of puberty as the influencer of human’s future personality, health and social connections, it’s necessary to apply on time, multidimensional, culture- based education in this age. Studies have shown lack of awareness in adolescents about puberty physical and psychological health; and lack of comprehensive puberty education program. The purpose of this study is to provide Islamic and culture- based education material and also methods of different aspect of presentation. Method: This review study was held by desk research methods. Physical and psychological health academic sources and Islamic books and articles were searched. Result: Results shows puberty education can be held in three stages; giving awareness, notion internalization and behavior regulation. Also Islamic and cultural educational methods such as how to start an education, the role of an instructor and the content of education program, were found helpful. Conclusion: Depth and helpfulness of Islamic and cultural sources; especially in case of maturity, puberty and youth, necessitates designing a multidimensional educational program concerning puberty’s vast dimensions; such as physical, psychological and social growth; through window of Islam and Iranian culture. 1) Beal, Hoijier H, An Introduction to Anthropology, 5th edition, Macmillan publishing Co, Inc. New York, 1997. 2) Farokhnia R, Kazazi A, Assessing puberty process in girls through anthropological view in Arak; J. of anthropological letter, 2004;5: 99-120. [in Persian]. 3) Smith E, Nolen-Hocksema S, Fredrickson B, Loftus R, Atkinson & Hilliard’s Introduction to Psychology, 14th edition, Thomson: Wadsworth; 2003. 5) Berk L, Development through Lifespan, Pearson;2013. [in Persian]. 6) El-Shahat KH, Khaled N, El-Far F. Influence of growth hormone on growth and onset of puberty of Rahman ewe lamb. Asian Pacific Journal of Reproduction. 2014;3(3): 224-30. 7) Najafi M, Javaher-al-Kalam fi Sharh sharaye al-Islam, Lebanon: Beirut,1991; 9th chapter, p.236. [in Arabic]. 8) Kouhstani H, Rouzbahani N, Baghcheghi N, Puberty experiences in male adolescents: A Qualitative Study, J. of Nursery faculty of Iran university of medical science, 2009;22(57): 53-65. [in Persian]. 9) Anousheh M, Niknami S, Tawakoni R, Faghihzade S, Assessing Education in Adolescence: A Qualitative Study, J. of Idea& Behavior, 2003; 9(2): 64-70. [in Persian]. 10) Mohammadjani S, Yarmohamadian M, Kajbaf M, Qaltash A, Curriculum Pattern for sexual discipline in Adolescence according to Holy Quran, J. of Educational management, 2016; 7(3): 19-44. [in Persian]. 11) Moosavibojnourdi M, Puberty, J. of Matin, 1999; 2(18): 81-98. [in Persian]. 12) Farhoudinia H, Kavoosi P, Assessing relation between cerebral development Importance and child and adolescent responsibilities, in Islamic resources and Iranian- Islamic pattern, J. of family study in Islam,2017; 5(9): 113-136. [in Persian]. 13) The Holy Qur’an, Nesa, Verse 6. Tehran: Mash’ar;2011. 14) Mousavibojnordi M, Assessing Childhood concept in Islamic notion and Iran’s regulation to gain related rights, J. of Matin, 2003;21(5): 27-61. [in Persian]. 15) Madan Y, Rafiei B, Sexual discipline in Islam, J. of Islamic discipline 2004; 8: 183-218. [in Persian]. 16) Hasani Z, Asgari S, Families impact on sexual discipline in children and adolescent, J. of School Counselling, 2010;21: 16-20. [in Persian]. 17) Meghdadi M, Javadpour M, Children sexual abuse prevention in Islam, J. of Bio, Ethics, 2016; 7(23): 62-92. [in Persian]. 18) Bahadoran P, Arizi H, The impact of education program in female adolescent’s attitude toward menstruation, J. of Education in medical science, 2006; 6(2): 27-35. [in Persian]. 19) Babaei N, Assessing self- confidence developing methods, J. of school counselling, 2006;4: 8-17. [in Persian]. 20) Farhadian R, Operational methods in self-confidence development, J. of Peyvand,1997;220:15-19. [in Persian]. 21) Maktabi G, Maintaining self confidence in children and adolescents, J. of Peyvand,1993; 172: 16-23. [in Persian]. 22) Al-Kulayni T. Al-Kafi. Iran, Qom: Dar al-Hadith;2008; 2nd chapter, p.5556. [in Arabic]. 23) Zanguyi A, maintaining responsibility taking in adolescents based on Islamic discipline, (Dissertation). Tarbiat Moddares university;1991. [in Persian]. 24) Nabavi S, Methods of teaching responsibility taking in adolescents, J. of educational science, 2013; 402-403: 84-87. [in Persian]. 25) Mohammadireyshahri M, Awareness and responsibility, Iran, Qom: Hodheh advertisement office 2018. [in Persian]. 27) Ata Pourabbasi, Jalal Farzami, Mahbubeh sadat Ebrahimnegad Shirvani. Health and disease definition according to telos of life from the perspective of religious teachings: a basis for interventions in educational medicine. Journal of Research on Religion & Health. 2016, 2 (2): 54- 58 [in Persian]. 28) Nooralizademianji M, Islamic model of sexual behavior correction based on prevention and treatment, J. of Islam and Psychology, 2009; 5(3): 107-142. [in Persian]. 29) Raghebesfahani H, Al- mofradat fi qarib al- Quran, Syria: Dameshq;1991. (Full Text in Arabic). 30) Shahbaz S, Masoudian M, Privacy through holy Quran, J. of interdisciplinary research in holy Quran,2012; 3(2); 100-108. [in Persian]. 31) Atashpour H, Adolescents and peer pressure, J. of discipline, 1997, 58062. [in Persian]. 32) Javadi Amoli A. Mafatih-al-hayat. Iran, Qom: Asra; 2012. [in Persian]. 33) Pourabbasi A, Ebrahimi Qavam S, Ebrahimnegad Shirvani M. Eliciting physical-behavioral strategies for adolescents’ management of their sexual drive/behavior from Islamic resources (the Quran and Hadith) and experimental studies. J Res Relig Health,2018;4(1):93-103. [in Persian]. 34) Salimi G, Keshavarzi F, Heidari E, Relation between psychological empowerment and maturity in PhD. Students in Shiraz university, J. of educational management,2014;5(3): 1-22. [in Persian]. 35) Osare A, Nasri S, Assessing parents and students’ educational needs in different Iranian subculture, J. of educational innovation,2005; 14: 64- 105. [in Persian]. 36) Moghadam a, Education in virtual space: interdisciplinary window to create science, J. of Interdisciplinary study in liberal art, 2013;5(4); 135-159. [in Persian]. 37) Amidimazaheri M, Sabetghadam M, Mother’s point of view in female adolescent sexual behavior, J. of Behavioral Science,2005;3(1): 55-60. [in Persian]. 38) Nourisistani M, Marghaeikhoyi E, Impact of peer-based education method on female adolescent’s physical function through their puberty, J. of Arak university of medical science, 2008; m12(4): 129-135. [in Persian]. 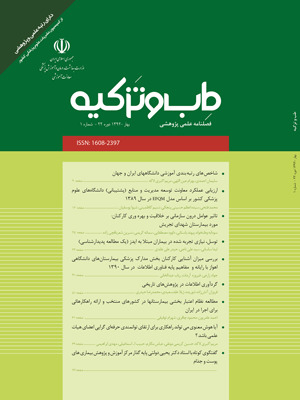 39) Abdollahi F, Shabankhani B, Khani S, Assessing female adolescent’s educational need in Mazandaran province, Iran, J. of Mazandaran medical science,2003;14(43):56-64. [in Persian]. 40) Zabihi H, The study of educational effects on knowledge and practice of health puberty among female students in Babol, J. of Babol university of medical science,1378;1-9. [in Persian]. 41) Kashefi F, Nasirizaringhobaei D, Bavandi H, Aliakbari R, Akaberi A, Sharghi A, Awareness and behavior in high school female students about menstruation hygiene in Bojnourd province, Iran, J. of Khorasan university of medical science,2013;5(5):989-996. [in Persian]. 42) Neisi N, Ashrafi A, Hoseynirad M, Dirkondmoghaddam A, pournajaf A, Assessing awareness, attitude and function toward puberty health in 3rd grade female students in guidance school in Ilam province, Iran, J. of Ilam university of medical science,2013; 24(1): 25-28. [in Persian]. 43) Ahmadi B, Puberty health needs in girls, published in national congress of health and prevention science,1379. [in Persian]. 44) Baharishargh R, Shokravifarkhonde A, Anoushe M, Goudarzi A, Assessing awareness of blind girls about puberty health, J. of martial science and protection,2016;3(4): 2263, [in Persian]. 45) Eslamimehr F, Ramezankhani A, Khodakarim S, Rakhshani F, Assessing puberty hygienic behavior and related factors in female adolescents in Khamir city, Iran, J. of Shahidbeheshti university of medical science,2016;4(2): 11-18. [in Persian]. 46) Kalantari S, Ghana S, Sanagu A, Mahastilooybari L, Puberty and sexual education to girls: mom’s experience in Gorgan province, Iran. J. of health development management,2013;2(3): 74-90. [in Persian].